The appleton 12 is a fine semi dry sipper, with hints of spice and chocolate. I've never tried the bacardi 8, but if you give it some time to oxidize, it may open up. Leave it aside and come back to it in a few weeks time and try it then. I can't argue with anything you said there, which is why I bought the Seale's first. But my palate dictated otherwise this weekend after I saw the MGXO on sale for $30 (had to pick it up at that price). But I do need to do a SBS next. I was on vacation this past week in Puerto Rico and on the flight back home I had enough time in the San Juan airport to make a purchase in the duty free store. I bought a bottle of Bacardi Reserva Limitada for $70, which the box indicated is around 12 years old, and it appears is not readily available in the mainland United States. They even put it in a cool black faux-canvas bag (like the reusable grocery bag material) with the Bacardi logo on it. It is likely to be a while before I get to try it but I look forward to opening it. Finally did a SBS with MGXO and Seale's 10yo. And I could not tell one lick of difference. I don't think my palate is sophisticated enough yet when it comes to rum. I thought I liked the MGXO better after having each individually in week's past, and I'll do this SBS again another time to make sure, but until MGXO clearly outshines the Seale's I might as well just buy the latter and save some coin. Interesting, dcbt. I'll have to try this again myself in April. 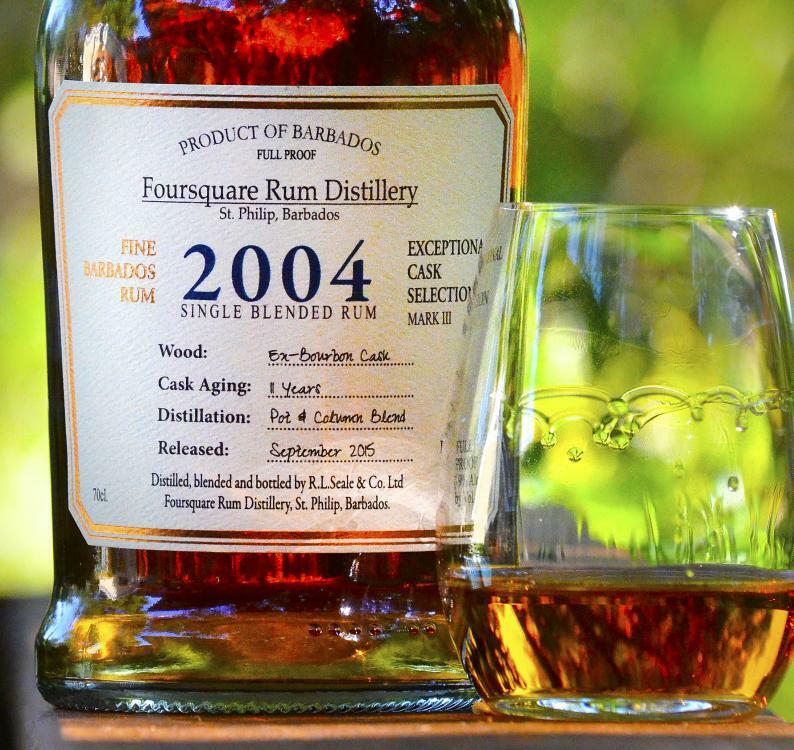 It's certainly a great excuse to drink two good rums! Amrut Old Port and Four Square Port Cask. Restocks on The Scarlet Ibis and Appleton 12. Getting closer to tiki time! How much is The Scarlet Ibis in your area? I saw it for the first time here in CA and it was $39.99. I passed on it for the time being but may go back for it. Will have to check but at least mid $30's sounds about right. Could have been as much as $39.99. I don't think it was any more than that. I picked up an older bottling of Cadenhead's Jamaican 20yo Green Label rum yesterday. I've had Cadenhead's NAS Green Label rum and like it quite a bit, so I couldn't pass this one up! The store owner said it had been gathering dust on the shelves and he moved it to the window to try to get it to sell...and it worked. I did a quick search here and found that dougdog picked up a bottle of this in 2005 and he made a reference to it being on the shelf for a while, even at that time. Unfortunately there weren't any tasting notes and I couldn't find much else here or online about it, so any additional info is appreciated. I unfortunately don't have any experience with this one but I wouldn't mind a chance to get some! Maybe Paul/Black Tot has and will comment when he sees this. Is it 46 ABV? I did find an article that noted a similar rum was sold at Binny's in 2001 for $48 dollars. Hopefully you got a good price on it! Otherwise there doesn't seem to be much info out there about it. Thanks Bruce - I hadn't seen that article, but that's exactly what I was looking for! It is 46%abv like you said so it's probably the same one, and the 2001 date seems to fit. I paid more than $48 for it but I think I still did better than current market price, considering what other private rum bottlings go for around here. Jamaican rum isn't my specialty (yet...who am I kidding? ), but I'd certainly be excited to try this. I'm only a little concerned about the fading of the label, suggesting it may have seen a lot of sunlight in that store window. It's a lovely color for 46%, and my guess is you'd struggle NOT to enjoy this. Can't wait to read your notes on this one! Thanks, TBT. You're an expert by my standards. I'm also concerned that the faded label indicates this was in the sun for a little too long. I'll be sure to post notes when I open it up. I have a few Foursquare bottles en route. Doorly's XO, Doorly's 12 year, and RL Seale's 10 year. Looking forward to trying them! Also picked up a couple bottles of smooth ambler revelation batch 2 a few weeks ago. That bottle of Cadenhead 20yr Jamaican is a gem. It's a great example of pot still product properly aged. My bottle only has a few oz left and it doesn't get to the share table. If it had been bottled at barrel proof we would be talking about it in the same breath as some of the Velier's. Pot and Column blend, eh. So, is it any good? And is it available in the US or from your recent Caribbean trip? Saw Coruba Dark Jamaican rum locally for the first time and at $15 I couldn't resist picking up a bottle to try. No telling what sort of additives it might have but for that price what the heck. Was hoping to find an overlooked Clement XO as this store doesn't seem to move their inventory that fast. But alas, they were gone. Plenty of Homere but no XO. Picked up something else from the rum aisle as well but now it escapes my mind completely! 2oz Auntie Lillikoi's Passion Fruit Syrup. I've played with other rums in the mix, but I have to hand it to the dood, the Coruba works really well here. I found a bunch of CJ Wray's white rum in an old store today. Nothing special, but a cool bottle not available anymore. I like the bottle design. Sounds good! I may need to whip up a few this weekend to help kick off the 2016 Hurricane season as a tropical depression tries to form into TS Bonnie off the east coast of South Carolina. Of course Alex already started the season as only the second hurricane to form in January since folks have been keeping track. The last was in the 50's as I recall. Besides, what's not to love in a drink with 2 ounces of passion fruit syrup in it. Yikes! Totally, - but seriously, make it A. Lillikoi's. That's also an insistence from the dood. Lovely business. I buy their passion fruit syrup by the (usually multiple) case. No syrup available from Aunty locally and no time to order or make a quick trip out to the islands so I had to make do with BG Reynolds (which is apparently undergoing a rebranding with new, less cartoon like labels). Portland is kind of Hawaii East so it was the best I could do. Still seemed pretty good to me!